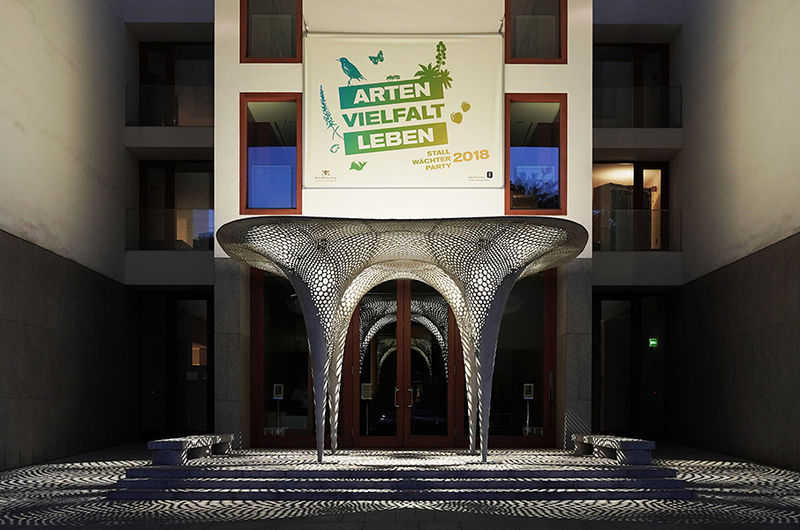 Rosenstein Pavilion that was originally designed and realised for the special exhibition »Baubionik – Biologie beflügelt Architektur« in October 2017 in Stuttgart is now exhibited in Landesvertretung Baden-Württemberg in Berlin. 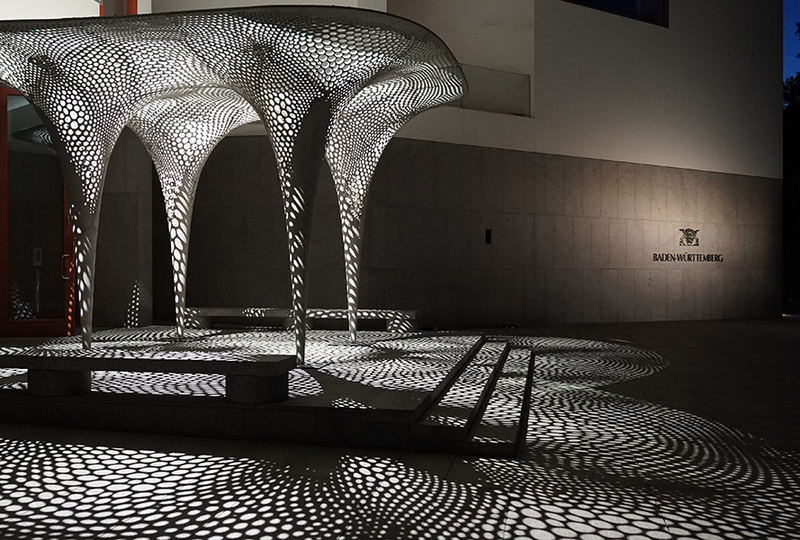 The concept of the pavilion is based on a research conducted in B04 subproject with the focus on the transfer of biological principles into structural features of construction objects. Inspired by high-performative biological tissues, such as bones and exoskeletons, the weight of the structure was reduced by distributing the material according to the stress state in the structure, also known as functional gradation. In order to make this principle apparent to the visitor of the exhibition, the state of stresses in the construction was visualized by a functionally graded porosity. 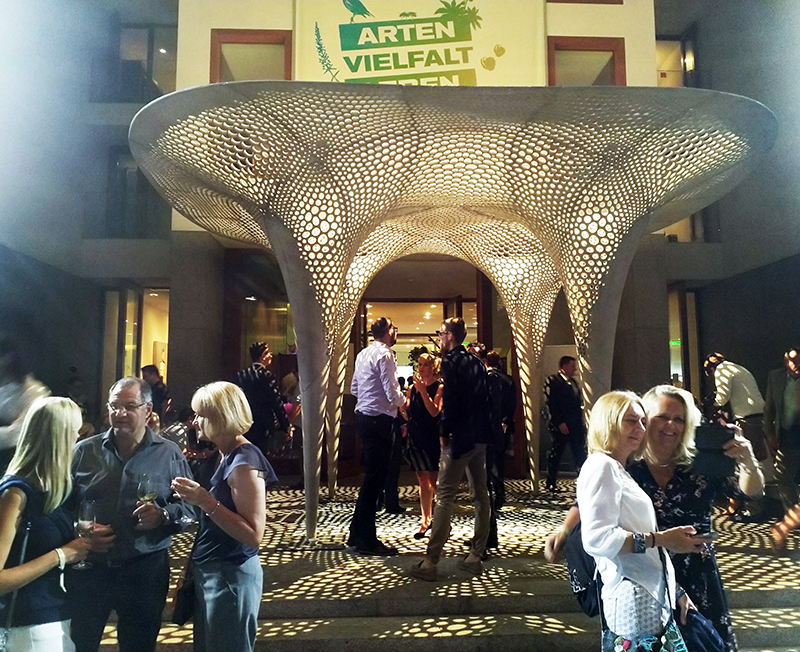 Accordingly, the Rosenstein Pavilion was designed as a porous shell, which covers an area of 36 m² standing on four supports and weighs only 1.7 tons due to its optimised internal structure. The weight of the structure was reduced by 40% in comparison with continuous concrete shell of the same load-bearing capacity. The distribution of the porosity was developed in an iterative design and analysis process until the desired architectural expression was found. Thus, the appearance of the pavilion is a direct expression of the intrinsic connection between form, structure and material. Due to the manufacturing and transport conditions, the shell was prefabricated in individual segments and assembled on site. 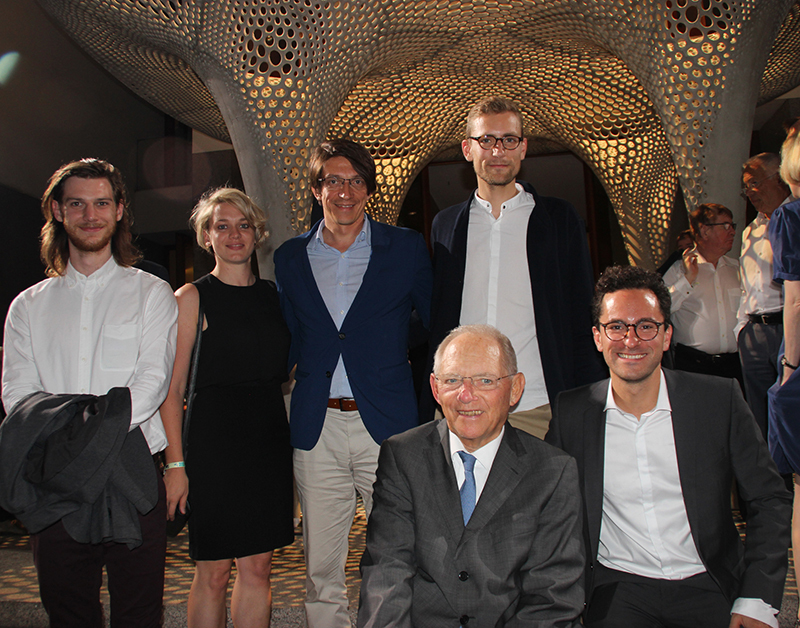 The Rosenstein Pavilion sees itself as a contribution to a new type of design process in which the goal of conserving resources is actively worked out together by architects, structural and mechanical engineers from the very beginning of the project. In this context, structural optimization for the purpose of saving building materials is understood as a means of designing the emerging architecture.